Plant Your Seed with Us • Single Seed Enrichment School Inc. Since our first meeting in February 2017, Single Seed has grown steadily within the San Antonio community. Our after-school tutoring program, offered at no cost to families, continues to provide Bexar County youth with individual opportunities to grow academically and socially. We remain committed to supporting the community through personalized educational experiences. Our services include tutoring, co-op instruction, and parent consulting. In recent months, we’ve started receiving referrals from other organizations, which is a testament to our effectiveness. To meet the growing demands for our services, we need the support of other generous individuals who want to make a difference. Our partners’ contributions fund 100% of costs to implement our programs and their expansion. Through this new initiative, Plant Yours, we hope to connect with others who have a passion for educational equity and innovative learning. While staying true to our Texas roots, we’ve created four monthly donation levels. Our goal is to have 60 monthly partners by December 31. We’re excited about the progress we’ve made and look forward to a bright future! 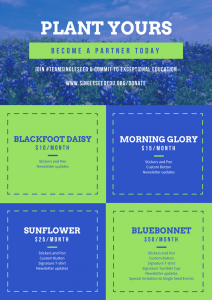 Become a Single Seed partner. Single Seed Enrichment School is a 100% volunteer-run 501(c)3 nonprofit that provides life-changing educational support to youth and their families.